A sensation in his first Formula One season. A rookie at the top of his game and already on the top of the podium as well. A stunning debut year to set him on the path to greatness. Sound familiar? 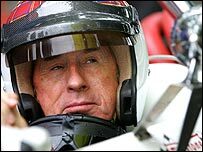 But for Lewis Hamilton in 2007, you can also read Jackie Stewart in 1965. Forty-two years ago, the flying Scot was turning heads in much the same way as Hamilton is now. Ninety-nine Grands Prix lay ahead of him, and he would win 27 of them and lift three world titles before he retired. It is a very different sport now and Stewart is a knight of the realm but the 68-year-old Scot knows better than anyone what lies ahead for Hamilton. "It must be one heck of a rocket ship ride at this stage, a lot of blur," Stewart says of Hamilton as the 22-year-old McLaren star heads into his home Grand Prix at Silverstone this weekend. "Not a lot of focus as to what is going on around him. He must pinch himself from time to time to waken himself up. "It took Hamilton six Grands Prix to win," Stewart continues in an interview with BBC Sport. "It took me eight races to win one. When I won mine, I was amazed as I always thought the competition was better than me. "Hamilton will be surprised that suddenly he is ahead of [Fernando] Alonso and [Kimi] Raikkonen. He is out-performing [fellow Britons David] Coulthard and [Jenson] Button overnight. "Of course he knows he's in the best car but it will still be difficult to see the realism." Hamilton has a few years on Stewart - he is three years younger than when the Scot started out in F1. The maturity he has shown away from the track has been as impressive as the driving on it. To a certain degree the fact that his two F1 wins came in North America has shielded Hamilton from the glare of publicity. Now he is back on the European circuit, closer to home and just days away from his home Grand Prix. When the Hamilton roadshow arrives in Silverstone, the attention will be intense. "He's seen very little of the furore he's caused," Stewart added. "That intoxication and euphoria will test him. "A sudden surge of awareness, money and fame is a tough thing to handle. You need real values and focus. He stands to make more money than any sports person has ever made. "It's an industry bigger than soccer, rugby, cricket and tennis. He could be bigger than [Roger] Federer and Tiger Woods." The Hamilton story has almost run out of superlatives. Talking to Stewart about the sport's favourite subject, his answers are littered with words like "amazing", "impressive", "fantastic" and "fairytale". He is clearly a fan. But, just as Stewart can see the potential, so he can predict some pitfalls. "He's breaking new ground but this is not par for the course," he says. 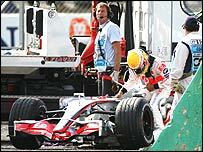 "McLaren have had plenty of disappointments in the past and know how quickly the points change on the railway line. Suddenly you can be shooting off in a direction you wish you had never started off on." Hamilton tops the driver's standings by 14 points, with Silverstone marking the halfway point of the season. It is an intimidating lead but Stewart, who took four years to win his first title, is not confident the Englishman can do it at the first attempt. "It will be a struggle for him to win the world championship," he continued. "I don't think you've seen the end of Alonso or [Felipe] Massa and Raikkonen. "You could easily not finish two or three Grands Prix in a row and suddenly, topsy-turvy, the world championship lead erodes itself very quickly. "The fat lady hasn't sung yet, there are still nine Grands Prix to run and we haven't seen the end of Alonso, believe me."